After 4 hours sleep my alarm woke me at 4am. I quickly got ready and set off on my long journey to Carl’s house. There was no need to pack a case for this trip as I’d left everything in Austria a few days early; all my pedals, my guitar and clothes would be there, waiting for me in Pisa (if all went according to plan!). I spent the drive to Carl’s house listening Transatlantic’s ‘The Whirlwind’ – I thought the album was good the first time I listened to it, but it just keeps getting better and better! As I approached his house I got a call from Carl asking if everything was OK (I was a couple of minutes late owing to the fact that I’d met some road works with on the way). When I turned the corner to enter Carl’s road I saw a car waiting at the end of the road; Carl, Stuart and our driver were already in the car and waiting to leave for the airport – woops! I parked up my car, got into the taxi and we made our way to the airport. As we didn’t have any bags to check-in and our guitars were already waiting for us in Italy, we would be flying budget today – Ryan Air. I walked into the airport with only my laptop case and a carrier bag contain underclothes, the only way travel! When it was time to board the plane, we watched as Ryan Air’s staff weighed and measured everyone’s bags, in order to check if they met the company’s regulations. This final attempt to get extra money out of people before they got on the plane seemed to work very well – they had a dedicated baggage checking desk at the gate, complete with a very well used credit card machine to take payment from anyone whose bag was even a little over weight or size. Before I boarded the plane I was told that I’d have to put my tiny carrier bag containing a few underclothes into my tiny laptop bag. Thankfully Stuart had plenty of room in his sports bag, so both Carl and myself put our carrier bags inside his bag, which seemed enough to satisfy the Ryan air staff. 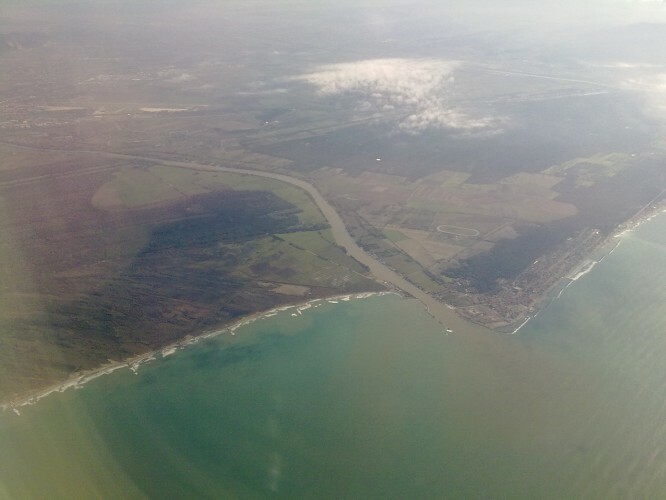 I slept a little on the plane, in between what felt like a constant barrage of adverts being announced over the aircraft’s loudspeakers (plugging products such as hot drinks, cold drinks, spirits, hot food, cold snacks, smokeless cigarettes, phone cards, train tickets, bus tickets, duty free and scratch cards). When we reached Pisa airport the promoter for the evening’s gig met us. He took us to his car and drove us to our hotel. On the way I asked him if we could stop for pizza. After a few minutes of confusion (owing to the fact that the words ‘Pisa’ and ‘pizza’ sound remarkably similar) he took us to a pizzeria in a large shopping centre. The pizza was amazing – mixed vegetable and Parmesan cheese; well worth persisting with the Pisa/pizza conversation. As we neared our hotel the promoter explained that it was in the countryside just outside of Pisa and that they did a very good ‘biological breakfast’. We were intrigued – forget the gig, I couldn’t wait until the next morning when I’d get to experience my first ever biological breakfast! When we arrived at the hotel we learned that Simone would be arriving at around 5pm. So, with no guitars to practise with, there was nothing for it other than to head to bed for a few hours. A nice Italian lady showed Stuart and myself to a room up a metal staircase on the outside of the building. Once inside we found a kitchen and a bedroom. A little later the nice Italian lady came and converted a sofa in the kitchen / living room into a bed, which was due to be mine for the night. At around 4.30 Simone arrived with our guitars and pedals – giving Stuart and myself an hour to re-familiarise ourselves with our instruments. At 6pm we set off for the club. We’d played this venue a few years previous and so we knew what to expect – a cool music venue with lots of interesting décor: the front of a Cadillac hung above the bar – its light’s flashing in sequence, an assortment of animal skulls decorated the walls along with photos of various people who had played there. 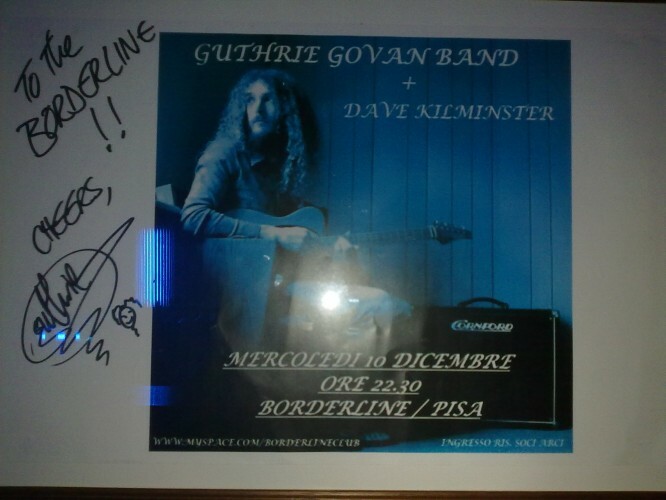 Among the photos was a signed poster from a Guthrie Govan concert. Guthrie, for those of you who don’t know him, is an amazing guitarist; he’s actually the guy who recommended me to Carl for his band when he was looking for another guitarist (see my biog page for further details!). After a quick sound check we headed to a local restaurant where we gorged ourselves on Penne Arrabiata (pasta in a spicy tomato sauce) and Cinghiale (wild boar) – a combination we try to have whenever we’re in Italy. Feeling absolutely stuffed, we made our way back to the club and dressing room where I had around an hour and half to warm up and change my strings. Eventually the time came for me and Stuart to go out to check everything was in order with our pedals and amps (a ritual carried out every gig, ever since my fourth gig with the band when I hit the opening chord of the first song, only to hear a thunderous nothing!). When we tried to get to the stage we discovered that the room was much too full (the dressing room was a side door in the main room of the venue) so we all headed out together just before we were due on stage. Stuart and I checked to see if everything was working just before we our intro music started – it was, panic over. The show went well. The audience was appreciative but a little noisy in places (particularly noticeable in some of the quiet moments of the set). During a quiet section in Pictures at an Exhibition I politely asked a lady at the front of the stage to be quiet (using the international ‘shush’ signal) and I things seemed to improve from that moment. After the show I had the opportunity to meet a lot of people in the audience – we chatted and I made some new friends.